For many people, owning an RV is one of the best ways to hit the open road and see the country’s natural wonders. If you have one of your own, it’s important to properly care for this vehicle. After all, providing the right protection can increase its longevity and ensure it takes you on many more adventures. Perhaps one of the best methods to protect your vehicle is with metal RV covers. Consider the benefits listed below, which outline why you should consider such metal structures. When left out in the elements, your RV is subject to damage from a variety of sources. Sunlight, UV rays, dirt, and debris can all damage the vehicle over time. UV rays can cause the exterior paint to crack and fade, and it can even damage interior fabric like leather and vinyl. Dust and dirt, meanwhile, can cause microscopic abrasions, which harm the paint and overall exterior over time. Weather can also cause problems for your vehicle, particularly if the area is likely to receive acid rain or heavy winds. Strong metal covers are capable of resisting such problems while keeping these damaging elements away from your RV. 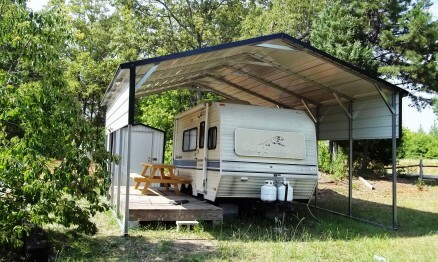 A cover or custom metal building can also prevent your RV from experiencing a moisture problem. When combined with dirt and grime, moisture creates black streaks that run down the side of the vehicle. These are nearly impossible to remove if they’re allowed to sit, and they significantly decrease the RV’s resale value, resulting in headaches for sellers. If you own an RV, consider protecting it with a metal RV cover from Stor All Custom Metal Buildings and Roofing in Dothan, AL. With a wide array of fully customizable metal roofs and awnings, these experts can create the cover you need to truly protect your vehicle—all at an affordable price. Contact a building contractor today to learn more about their services by calling (334) 685-0175. You can also like them on Facebook for the latest updates.